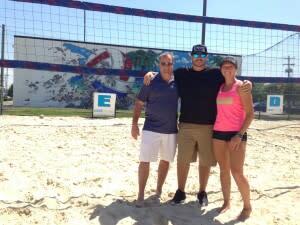 David Straub never intended to build what he believes is the country’s largest beach volleyball facility and entertainment center, and the site of the National Volleyball League (NVL) Midwest Championships Beach Volleyball Pro Tour event July 14 to 16. “My motto has always been to take want the defense gives me,” Straub said. What this football expression meant to Straub as he built and expanded Flannagan’s Dublin (which is actually in Columbus) the past 20 years is simple: Give his customers what they want. And what they wanted was to play beach volleyball. Lots and lots of beach volleyball. There’s also a large, Las Vegas-style pool with a swim-up bar and a big indoor facility. The large number of courts and all the other amenities, combined with central Ohio’s massive number of volleyball players, made Flannagan’s a natural to host an NVL pro event. This is the first time the NVL is coming to Columbus. “It was always in the back of our minds that one day we could host something like this,” Straub said. Robertson grew up playing beach volleyball in Clearwater Beach, Florida and has become an ambassador for the sport in the Columbus area. He also runs Chaos Volleyball, a smaller, professional beach volleyball league that holds all of its events at Flannagan’s. Evenings and weekends Flannagan’s are packed with beach volleyball players playing non-stop pickup games, league games and tournaments, a total of about 5,000 players every summer. Flannagan’s is one of several outdoor beach volleyball facilities in central Ohio, an area that loves volleyball and hosts numerous regional and national tournaments, most at the Greater Columbus Convention Center. The NCAA Division I Women’s Volleyball Championship will be held Dec. 15 to 17 at Nationwide Arena. The Ohio State men’s volleyball team recently won the NCAA title. This is what brought Katie Yanesh here from Cleveland, to live, work and play beach volleyball at the professional level. Yanesh initially played on teams that featured four or six players on a side, but now plays two-person volleyball, which is the format at the Olympics and in professional leagues around the world. 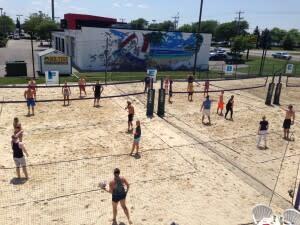 There were so many beach volleyball tournaments in central Ohio that Yanesh decided to move here a few years ago. She and her new partner, Krissy Sokol, who lives near Akron, will play in the NVL tournament at Flannagan’s. Perhaps the most famous beach volleyball player is Kerri Walsh Jennings, who won gold at the past three Olympics with now-retired partner Misty May-Treanor. Walsh Jennings was the featured speaker at recent The Women’s Sports Report of the Greater Columbus Sports Commission and will try and win a fourth gold medal with new partner April Ross. The NVL is in its sixth season of competition. The season began in May with the $50,000 East Coast Championships in Port Saint Lucie, Florida. Raquel Ferreira and Karolina Marciniak were the women’s winners, while Mike DiPierro and Steve Grotowski won the men’s draw. While beach volleyball is most popular on the beaches of Florida and California, there aren’t facilities as big as Flannagan’s along these sandy shores. “There’s no need,” Robertson said. “They just set up nets on the beach” like they did in Port Saint Lucie. Flannagan’s 13 courts are groomed daily and feature fine, but not too-fine sand. And yes, jumper’s knee hurts, as does “bottoming out” which is when a player dives and lands on hard-packed sand. Click here for tournament information for the NVL Midwest Championships Beach Volleyball Pro Tour event at Flannagan’s Dublin.